When John was on his mission in Guatemala, he had a companion from Mexico. 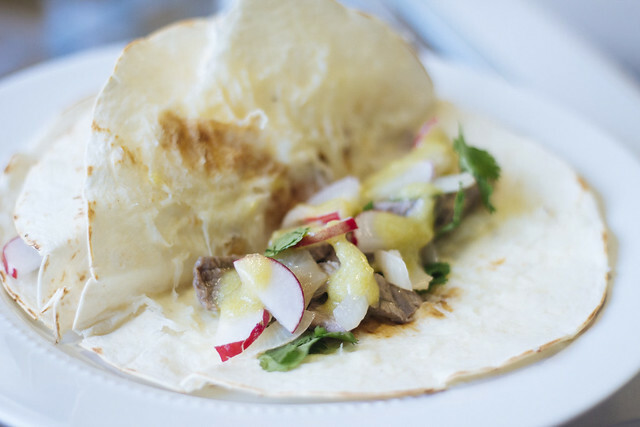 The companion’s family owned a taco shop, and he taught John how to make authentic tacos. John makes them pretty regularly now (usually on Sundays after church) and he’s adjusted the recipe a little for our taste. The first time John cooked tacos for me a few months after he got home from Guatemala, the sauce was a little too spicy for my taste (depending on the jalapeños you use it can really pack a punch). Then one day he thought of adding a lime to the sauce, and voila. Better flavor and the lime tones down the peppers. I love that they’re so simple, but so bright and flavorful. All the fresh ingredients really make a difference in the taste and sometimes I think simplicity is best. Cut 4 of the limes in half and squeeze the juice onto the steak. Rub salt onto the steak (John sort of massages the juice and the salt into the meat). Set aside. Cut the tops off the jalapeños and place in a pan with one cup of water. You can also de-seed if you prefer a less spicy sauce, since the majority of the heat is contained in the seeds. Sauté with a garlic clove until the jalapeños begin to lose their color. You can add more water if necessary as they cook. 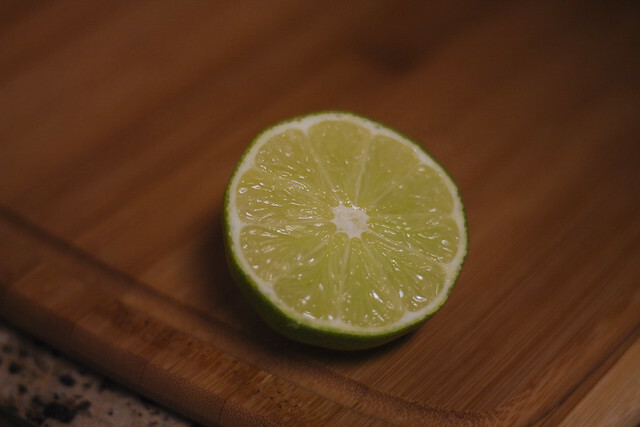 Place in blender along with the remaining lime (peeled) and blend until smooth. Cook steak until only slightly pink (medium). Cut steak into small strips. 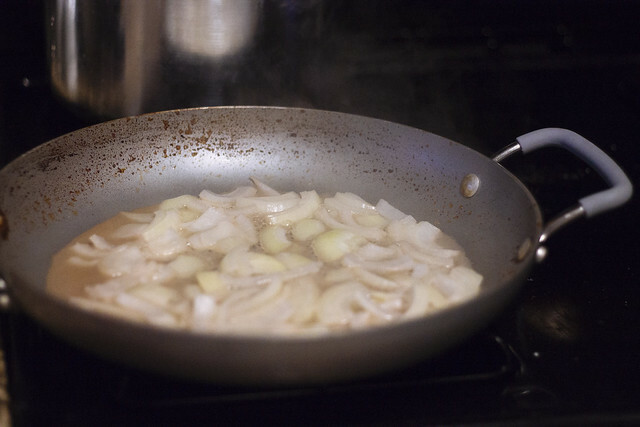 Chop the onion into small pieces and cook in the same pan with the juices from the steak. 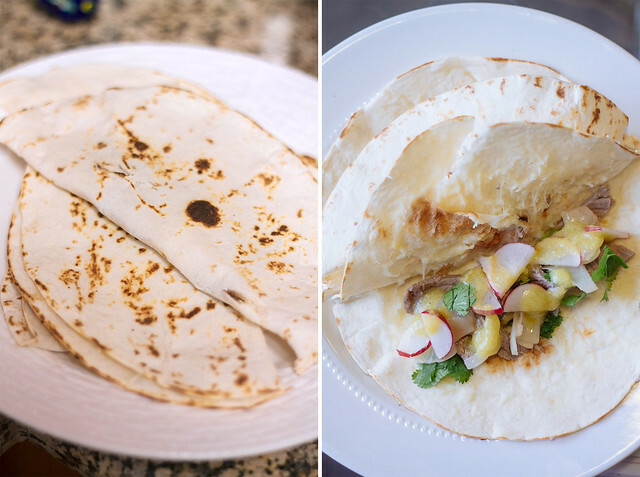 Heat each tortilla in a frying pan until slightly brown, then flip over and sprinkle with mozzarella cheese. Remove after the opposite site is browned. John folds them in half and piles them onto a plate, then before we scoop in the filling we peel each shell open. It keeps them nice and warm inside. 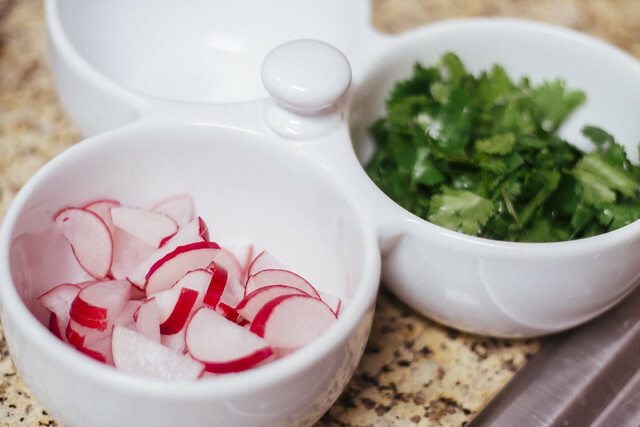 Serve tacos with steak, jalapeño sauce, cilantro, radish, and onion. Tip: the leftover jalapeño sauce is delicious on omelets. Yum! That looks amazing! Thank you for the recipe! You're so welcome! You'll have to let me know how you like them if you try them! We think they're pretty great. yum yum yum. i never feel like going out for mexican food, but for some reason i'll make it and eat it! my fiancé and i are definitely going to have to try this! You really will! They're different than any tacos I've had in the USA before but I love them. And if we're really celebrating or inviting people over, I usually make black beans too (basically drain a can of beans, let it simmer in some chicken broth, and add spices/seasonings like cumin, garlic, cilantro, etc). I like the recipe for black beans from Our Best Bites. Dang.. These look so good. They remind me of summer for some reason. silly huh? But I'll definitely have to try them out. Thanks for sharing! They remind me of summer too! I think it's all the fresh produce and bright colors. I hope you like them!